The future will soon be here with Volvo On Call, a new advanced telematics system using digital technology which brings exciting new functions that once only existed in the fantasy world of science fiction films. Volvo On Call, due to be introduced in late 2001, uses the computer networks in Volvo's advanced Multiplex electrical system and an integrated telephone to communicate between the driver, a Volvo call centre and even the car itself. receives a signal from the car via its Multiplex system and the integrated telephone if one or more airbags are deployed, An On Call operator will then call the car to assess the situation or automatically call the emergency services if there is no answer, and being in constant contact with the cars be able to provide them with an accurate location of the car. features an SOS button to call for help in the event of a personal attack or breakdown. tracks a car if it is stolen. 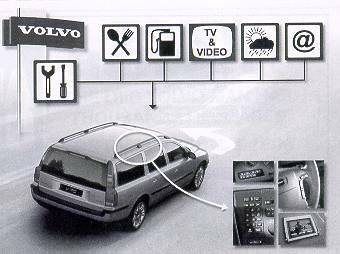 The Volvo On Call alarm centre can contact the car and get its precise position via its GPS unit even if its telephone is switched off. provides directions and advice. It will be able to answer questions such as: "Where is the nearest petrol station? ", or "How do I get to this address... ? " remotely unlocks the car if the driver misplaces the keys. If the driver calls Volvo On Call and quotes a special security code it can contact the car's electrical system via the car's integrated phone and unlock the doors. In order to be well protected, the phone unit is located in the middle of the car's dashboard. It is also collision-tested and copes with extremely high stresses. In addition, the phone has its own back-up system: if the collision is so powerful that the phone is dislodged, it has its own aerial and back-up battery so it can automatically send an alarm message. But this is just the beginning... At the first stage, Volvo On Call, as might be expected from Volvo, is primarily a safety and security system but it will be gradually developed to become much more than that. If a car began to develop a fault while driving, it will be possible to call a local service centre that can communicate directly with the car's computer networks to make a diagnosis over the phone and suggest appropriate action. To prevent worrying about younger members of the family from driving at high speed while borrowing your car, you could arrange for a speed restriction to be transmitted to the engine control system. If the car's own diagnostic system detects any malfunction (perhaps before the driver has noticed anything) it would be possible for the car to automatically contact the nearest dealer by itself, or automatically book itself in for a service when a particular mileage has been reached. It could be possible to access a range of other services through your integrated Volvo On Call phone - everything from local weather forecasts to stock-market information or a voice-activated e-mail system. The future could also offer interesting developments in the area of television and films. It is expected that more and more cars will have television on board and new technology will bring the option of downloading films on demand to keep passengers entertained on long journeys. 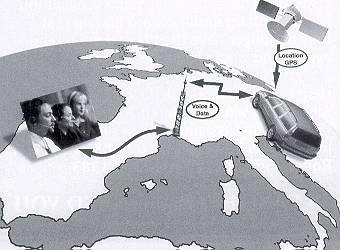 If it becomes possible to send television images to the car, then it will also be possible to send them from it. This may be useful for emergency vehicles - a camera in an ambulance could send images of the patient ahead to the casualty department, or maybe advice could be sent to ambulance personnel on actions they could take. Video cameras in cars could be activated by the car's alarm to send images to the Volvo On Call alarm centre of any thief breaking-in. "We cannot say at present exactly what will be offered in the future. It's imagination and technical development that set the limits. Development will obviously also be governed to a large extent by customers' wishes. But the examples we have mentioned here are all realistic and feasible in view of the plans that exist and development projects expected to emerge over the next few years," says Henric Perman of Volvo Car Corporation. "However, we at Volvo feel that we are some way ahead of the field with our computer-based electrical system. We are already opening communication between the phone and the car's network as we launch Volvo On Call. The first important step has been taken and the link is established," continues Perman, who concludes: "New cars with the Volvo On Call system installed will probably be able to add new services as and when they become available, because the present models - the Volvo S80, V70, Cross Country and the new S60 - already have the advanced Multiplex system."